Jingle Spells Bath Bomb is one that Lush describes as a "hangover cure"
I did not have a hangover when i chose to bathe in this...just so you know. Hmm, what do i say about this? The scent was nice. It's a very refreshing & comforting smell, which is possibly why it would make a good hangover cure. It smells of Juniperberry. 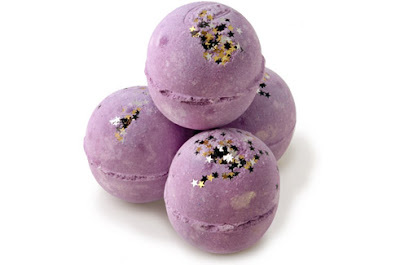 The best thing about this Bath Ballistic was the fact it turned the water dark purple & left my skin feeling slightly softer. I won't be purchasing this one again, the stars ruined it for me personally, i thought i'd be able to cope with the few on top...but it came with many a "bun in it's oven". If you are a ballistic person, and dont mind stars...this might be one to give a sniff because the smell was lovely.